If all this information is not put into some kind of order, we will become confused and overwhelmed. The voice of our inner self can still be dimly heard, but it is like trying to talk to someone in a loud and busy airport. You may be able to hear, but it is difficult to understand what is being said. Beta brainwaves are conducive to stimulating thinking and action. Most of our current education is beta geared, and is characterized by logical, analytical, intellectual thinking and written or verbal communication. Beta waves are the predominant brainwaves in our everyday life. Without Beta waves we would not be able to function in the outside world. Alpha Waves have a bridging capacity between our conscious and unconscious/superconscious minds, as well as a vivid imagery, and relaxed, detached awareness. When we completely relax, we shift into Alpha waves, which are between 8 and 12 cps. Alpha waves are slower in frequency than Beta, but have greater amplitude. A person who takes time out to reflect, or meditate or take a break from an activity is often in an alpha state. When we concentrate intently on one thought, emotion, or activity we have less stimuli to process and our brains can go into Alpha waves. With Alpha wave consciousness we are not bound by time and space as we are in Beta Waves. This frees our left-brain’s logical, sequential organization and allows us to also access our more creative and intuitive right brain. Our right brain thinks in pictures and sounds that are not bound by human language. Because of this, our thoughts, feelings, and/or activities are usually creative in nature such as dancing, writing, watching a good play or listening to enjoyable music. There are fewer distractions now and it is easier to hear our own inner voice. It is in this state that we have our moments of “A-ha”. Many performers, artists, scientists, and athletes consciously or unconsciously put themselves into Alpha state to achieve their inspiration and best performance. Alpha brainwaves are conducive to creative problem solving, accelerated learning, mood elevation and stress reduction. Intuitive insights, creative juices, inspiration, motivation, and daydreams characterize Alpha waves. These waves are relaxed yet alert. Therefore, they provide a bridge between our conscious and unconscious and/or superconscious minds. In fact, the mere act of opening our eyes or listening to the exterior world could bring in too much stimuli and shift our consciousness back to the faster brainwaves. It takes an experienced meditator to achieve this state, and then, even more practice to bring the information we gain in that state back to our conscious mind. To achieve this, we must be able to communicate this experience to our language centers so that we can “save” it to our cerebral cortex. Most often this Theta state is achieved only while sleeping and, as we all know, it is often difficult to bring the memory of our dreams into our waking life. When we do so, it is in our right brain, symbolic, imagistic language and not in the logical, sequential language of our left-brain. It is the bridging effect of the Alpha waves that can bring our Theta wave perceptions into our conscious mind. Taking time to relax upon waking, or writing and/or drawing after a deep meditation can carry the memory of our Theta wave experiences into our Beta wave thoughts. Theta brainwaves are conducive to profound inner peace, mystical truths, transformation of unconsciously held limiting beliefs, creating a better quality of life, physical and emotional healing, and finding our purpose and quality of life. They are characterized by a kind of knowing that feels like inner wisdom, faith, meditation, psychic abilities and the retrieving of unconscious material. Theta provides the “peak” in the peak experience. Delta waves are our superconscious empathy, interaction and radar connection to our full multidimensional perception. Delta waves are of the greatest amplitude and the slowest frequency. They usually range from .5 to 4 cps. They never go down to zero because that would mean that we were dead. In this state of consciousness our bodies are in hibernation mode. In fact, Delta waves are often associated with one being in a coma. Practiced yogis can consciously achieve this state. While in Delta brainwaves they are able to regulate their body temperature and heart rate. They may even appear to be dead, but they are able to revive themselves. Delta Waves are the deepest level of dreamless sleep in which our bodies shut down. It is in this state that our bodies can completely focus on healing and growing. Delta brainwaves are conducive to miracle type healing, divine knowledge, inner being and personal growth, rebirth, trauma recovery, oneness with the universe (samadhi), and near death experiences. Delta provides intuition, empathic attunement, and instinctual insight. When we fall asleep our brain shifts gears and our brainwaves begin slowing down. We start at Beta then go down to Alpha, Theta and then Delta. 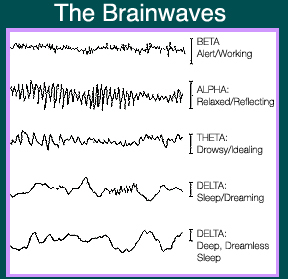 When we wake up, our brainwaves change in the reverse order of Delta, Theta, Alpha and finally Beta. Just as we unconsciously change our brainwaves in sleep, we can learn to consciously change our brainwaves while we are awake. To keep our brains in an effective Beta pattern, we can determine to narrow our focus to a few things at a time, and choose not to allow ourselves to indulge in obsessive or fearful thinking. We can take time out to relax, contemplate our lives and enjoy our creativity to induce Alpha brainwaves. We can meditate and/or pray and place our total focus upon our inner Self on a regular rhythmic basis to induce Theta waves. We can get plenty of sleep, “Let go and let God”, and surrender to our Soul to induce Delta waves. It is important to put aside a time at least three to five days a week to spend inside with your SELF. 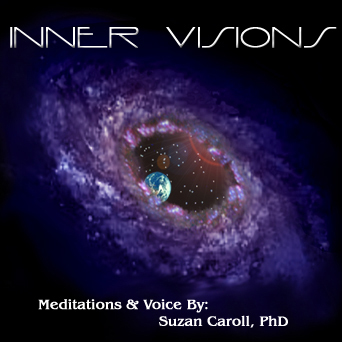 This meditation CD was created to assist you in that process. If we can put aside that special time, we can learn to gain a conscious mastery over our thoughts and emotions while living our everyday life. We can then realize that we choose our consciousness by choosing the thoughts and emotions we allow to linger in our mind. If we allow fear to dictate our thinking and surrender to feelings of fear, our consciousness will be overwhelmed by the myriad stimuli around us supporting that choice of fear. Our Beta waves will then become rapid and erratic as our awareness darts from enemy to enemy like a frightened rabbit. However, we are not rabbits. We have the ability to calm our thoughts and release our fear by focusing on love and calling to our higher guidance for protection and wisdom. This inner focus instantly lowers our brainwaves. With practice, we can learn to take a few deep breaths and call on our guidance and/or chant or visualize our mantra. A mantra is an inner or outer visual picture and/or a positive sentence that can be used to filter out fear and negative thinking. For example, a visual mantra may be a symbolic picture of a favorite place, a loved one, or a pet that evokes a positive feeling of peace and love. Verbal mantras work best if they are in first person, present tense. For example: I am successfully fulfilling my goal. If the mantra is in the future tense (I will successfully fulfill my goal.) it can be like a carrot on a stick that is never obtained. A mantra is used to “edit out” negative thoughts and feelings by shifting our focus from the negative thoughts and/or feeling to the positive mantra. When we receive fearful thoughts and feelings, either from our inner or our outer world, we can use our mantra to regain our balance in love. It is best if we choose a mantra that is associated with the fear. For example, if the fear is that we will not achieve our goal, our visual mantra is a picture of our achieving it, the verbal mantra is “I am achieving my goal” and the feeling is one that is associated with the fulfillment of that goal. If we can identify the fear before it is amplified by our conscious or unconscious attention, we can take a moment to close our eyes (limit our focus), take a deep breath (breath through the fear), and visualize a picture that is the antidote for our fear (choose another “channel”) while we say our verbal mantra and allow the positive feelings of love to override the fear. Once we have regained our footing in love, we can look again at the fear from our objective self. Does this fear carry a warning? If it does, then we can listen to the warning, act appropriately, and release the fear. Our “beta reality” would be one of many decisions and actions and our perceptions would be calibrated primarily to the third dimension. Our “alpha reality” would be one of creativity, artistic focus and relaxation, and our perceptions would include the fourth dimension along with our third dimensional reality. Our “theta reality” would be deeply spiritual and introspective and our perceptions would primarily be fourth and fifth dimensional. Our “delta reality” would be focused on our non-physical reality and our perceptions would be from our Light bodies—our Higher Selves. As we remember our multidimensional consciousness, we will be able to live all the above realities at once. Even though our brains are the radio, it is best to let our Heart Chakra choose the channel. There is much fear in the world and in our psyches. One of the most difficult aspects of learning to use our multidimensional perceptions is to differentiate the fear that is a warning from the fear that is paranoia. If we can learn to perceive our reality through our Heart Chakra, our fear will be greatly limited to warning fears. Then we can learn to listen for LOVE. Continue to: Where is Love?